Palmetto State Armory… I am the proud owner of #00300 series lower. You might say I am a early adopter. I had never really given an AR pistol much thought until PSA came along with their daily deal on a 10.5 inch kit. At $269 I felt this was just the ticket for a portable 0-200 yard pistol. I went for it. Let’s review it. The 10.5 inch Kit is my first PSA kit and I gave it a good look over. The furniture is nicely molded (I suspect the grip and hand-guard are made by Cav Mfg… Maybe?) and the fit and finish of kit’s various components was spot on. The bolt carrier’s staking was a bit weak. Trigger felt smooth and grit free, but it is a typical mil-spec trigger otherwise. Standardo trigger, but smooth enough. Evidence of test fire was present as indicated by carbon buildup on the rear of the bolt carrier. PSA is test firing these puppies. GOOD. Overall I would say the kit was well made. Impressive for the price… so what are we skipping? This model is not chrome lined, but their are other SKU’s which are the exact same configuration except they feature a nitrided barrel. Other than that, i’m just not sure how PSA is making money on these. 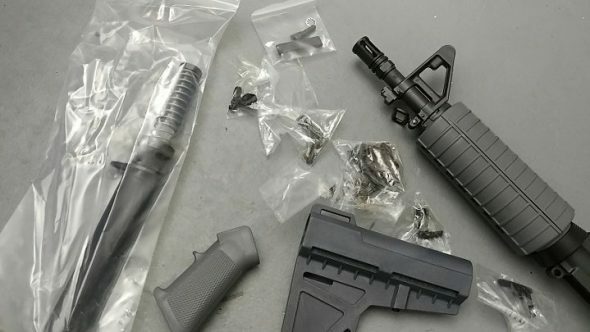 They are really cheap for a bare bones basic AR15. Once assembled, I was happy with the overall feel of the pistol. The whole shebang weighed 6 lbs on the nose according to my scale. A Chibi is a Japanese term for a super deformed, small caricature of a “normal” sized person or character. I feel like someone made a tiny caricature of an AR15 and that’s what I am holding. A super deformed, lethally cute, retarded small pistol thing. Let me google that for you. How do I know about Chibi’s? I blame children and Netflix / Crunchy Roll. Isn’t she cute? YES SHE IS, DESU! The pistol handles well. Coming off a 9lb HBAR build, it feels unusually light even when decked out. I imagined this as a 0-300 yard pistol, and the diminutive size should make it easy to carry around the property to dispatch critters. Let’s go shoot it! The pistol ran perfectly. I noticed some weak ejection with my reloads, but strong ejection with green tip and M193. The dwell time of these little pistols isn’t much of an issue when shooting full power ammo, but be cautious if your goal in life is to run reloads. The low weight means the pistol is a little bouncy due to recoil, but it’s a give and take. If you stick with the hot Nato stuff and you won’t have any issues. My friends and I ran 300 rounds through the pistol (mostly reloads) and it maintained its composure without any malfunctions. It was running hard right out of the box. Cascade ammo container. Budget done right. We sighted in at 25 yards about an inch low with the DIO red dot sight. We then nailed the little simulated 300 yard target at 25 yards by holding the dot on the face. We splashed steel targets and generally used the pistol at 25 yards for most of the range session. The light weight made the red dot a bit bouncy when shooting fast, but nothing that would hinder an experienced shooter. Add a brake and your results will improve… at the cost of a possible sinus headache. As is, the pistol had a great deal of concussive noise. It made my 20 inch gun feel like the muzzle noise was far, far away. All that said, the pistol shoots and shoots. It ran flawlessly without any issues. The trigger was a mil-spec affair, and the whole package was good overall quality for a basic kit. It isn’t a KAC or Larue, but you knew that looking at the price. We placed a scope temporarily to test for accuracy of the pistol. Even though it’s a pistol, we couldn’t leave out accuracy testing. Topping the pistol off with a 6x scope to evaluate accuracy allowed us to test what the chibi pistol could do. The little 10.5 kept my 55 grain reloads honest at 100 and stabilized my 75 grainers without issue. 55 grain XM193 hovered around 3.2 MOA with a ten shot group. 3 MOA with the 75 grain stuff ain’t bad at all for the little pistol. True, it could be more accurate… but you have other rifles for that. These little guns make handy 0-300 yard firearm and 3 MOA still allows easy hits at those ranges. The pistol likely has room for a bit more accuracy with more experimenting, but I am not going to sweat it. I have heavier, more accurate guns for jobs where I want the accuracy. This pistol is perfect for ranch work, self defense, plinking, and even camping. The blade brace works well against the forearm. It’s lightweight and functional. The pistol was reliable, and the parts kit was well made. I would like to see some firmer staking on the bolt carrier, but otherwise it’s a good piece of kit to have on hand. It’s good for the kids to shoot with, good for the petite imported Filipino wife, and good for clearing your home while holding the dog in your off hand… It’s just HANDY. It should be, it’s a pistol! My buddies also fell in love with the tiny pistol and were grinning from ear to ear. These pistol kits are still running about $269-279 for the “Shot Show Special” so pick one up and store it for a rainy day build. We won’t get prices like this again if our body politic leans further left. Diclaimer: I purchased this pistol with my own money as well as the Anderson lower receiver. That said, Palmetto state armory is an advertising partner with www.thenewrifleman.com. The New Rifleman LLC prides itself on disclosure and honesty. The above review is factual in that I encountered everything you read about above. If you want to look at these kits, click here to land on the PSA pistol kit page and scroll down to see their 10.5 inch models reviewed above! The Best Prices on Trijicon Acogs are at… Amazon? Great review! I’ve wondered what the “effective” range is from a 10.5″ barrel. Correct me if I’m wrong, but most of 5.56’s umfph comes from its fragmentation or yawing and that is only consistent when above 2700fps for 55gr and 2200fps for 77gr? So torso shots are only effective out to about 50 yards with this 10.5″ beauty? Fifty yards is more than enough for your stated purposes, I’m sure. But of course, shot placement is king, as always. Do you think 5.56 is good enough out of a 10.5″ barrel? Many shooters who run a 10.5 have mentioned they like to shoot barnes solid copper or other controlled expansion projectiles. These projectiles rely on expansion instead of fragmentation and can do so reliably in 10.5 inch guns. Im not sure of the velocity threshold but its buys more distance out than the loads you mentioned IIRC. Good info, thanks! Looks like 5.56 out of a 10.5″ barrel still has the foot pound energy at 100 yards (whether ftlbs is useful or not, I don’t know) as 9mm does point blank. I’m pretty sold on this. Hello. Good review. I’ve been a big fan of PSA lately. Recently built an M-4 freedom rifle using an Anderson lower for the future purpose of creating a DMR. I was surprised to find the lower’s threading for the grip stopped before the PSA grip screw did. Had to use some washers to rig it so it was tight. Did you run into that with this pistol kit? Hi! Could you please tell me what kind of Mount you used for the WML? I´m currently in search of one for a Standard handguard. That is a KermLock quick detach rail.